While nations and even states have anthems of their own, the Earth does not have one — effectively alienating the stateless and global citizens. It's time we pay homage to the one home we all in truth share. 12-year-old Noor was born in a refugee camp to parents who were uprooted from their home country. She feels sad that she has no national anthem to sing — unlike other children who sing their national anthems with great fervour. Stateless people across the world have the planet as their only home. While the exact number of these displaced people is unknown, UNHCR estimates tell us that there are at least 10 million such people globally — of which approximately one-third are children. Noor dreams that one day, humanity may share a common song, an anthem that can be sung by all children — no matter where they come from or who they are. Lorena is 8-years-old and has lived on three continents. Her mother is from Mexico, her father is German. She is often perplexed when her mother sings one national anthem and her father sings another. She is not comfortable singing either of the two. When she asks her parents why all of them can’t sing just one anthem, her parents don’t know what to answer. They are unable to explain that football clubs, universities and even schools have their own anthems — but the Earth does not. Julia is 28-years-old and has grown up mostly in Europe. In a recent Facebook post update, she wrote: “Earth is my home." Curious, I asked her why she said that. "The idea of national identities sounds so outdated in the age of the Internet and global connectivity. Earth is my home," she replied. A large number of young people who belong to the Internet generation feel like Julia and pour their sentiments onto social media with similar expressions. This emerging generation of global citizens also feels uncomfortable with the idea of national boundaries. They are seeking new ways to belong to a common orb by articulating alternate relationships with the world — employing new symbols, new songs and new languages. The concept of the world as our home, in fact, finds resonance in India’s age-old philosophical texts, the Vedas and the Upanishadas — “Vasudhaiva Kutumbakam — the whole world is a family." Yet, our planet is under severe stress from man-made climate change today — an ecological crisis that is staring us in the face. More than half of the wildlife lost in the last 40 years, density of accumulated greenhouse gases going up to 408 ppm from 280 ppm in the last 150 years, an increase in the average global temperature, the sea level increase from 0.3mm per year to 0.6mm per year, and the sea levels increase by 6 meters or more even if the world meets the target of the Paris accord. Plastic pollution is finding its way into everything — from the oceans to our food. To highlight this concern, the global Earth Day Network observed Earth Day last year by exhorting people to reduce plastic consumption aiming at a plastic-free world in the long run. 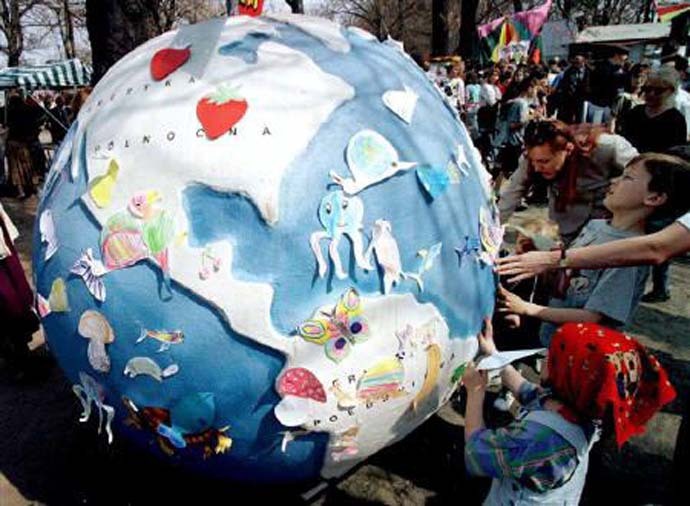 Earth Day was first observed in the United States on April 22, 1970, and helped boost the environmental movement across the world. 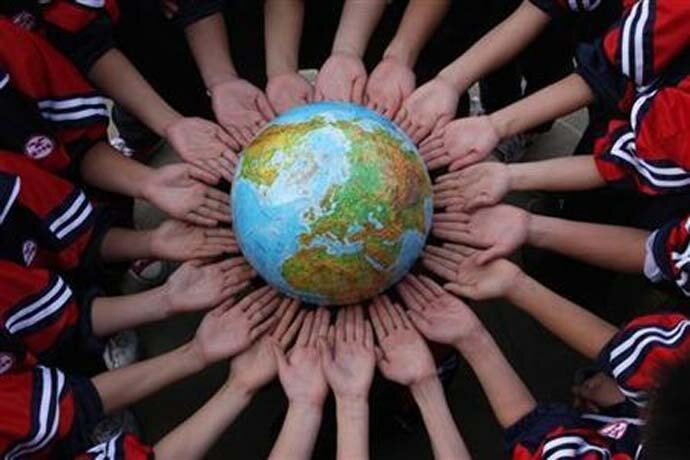 Thousands of people Google search the Earth Day Anthem on the day, as they do on World Environment Day, Equinox Earth Day, World Forestry Day and World Water Day among other such observances for the Earth. Similarly, thousands of cities take part in observing the Earth Hour every year from 2007 — it has already become the world's largest grassroots environmental movement. While these events are observed with enthusiasm across the world, there is still no common song to link up all of these events. There is a growing need for a common song for humanity — for our planet. Considering that the UN does not have an anthem, and a large number of stateless people, it would be worthwhile for the UN General Assembly to adopt a common anthem for our planet — which belongs to one and all — including citizens and the stateless. It would bring a smile on the faces of Noor, Lorena and Julia and billions of people who inhabit our planet with millions of other species. If adopted, such an anthem will bring a beautiful blue pearl moving through space alive in our imagination. Every time it is played, the inhabitants of this earth will take a silent vow to care for, protect and preserve it. Our shared home. Poet-diplomat Abhay K's most recent poetry collections include The Eight-Eyed Lord of Kathmandu and The Seduction of Delhi. He is the editor of 100 Great Indian Poems and CAPITALS.